Happy Sunday! I have mentioned before that my skin gets very dry very easily. That's why I thought it would be nice to share some of the best moisturizers I've come across for anyone else in the same position! Keep reading for pictures and my little commentary! I'm going to split this up into two parts, moisturizers for the face and body. 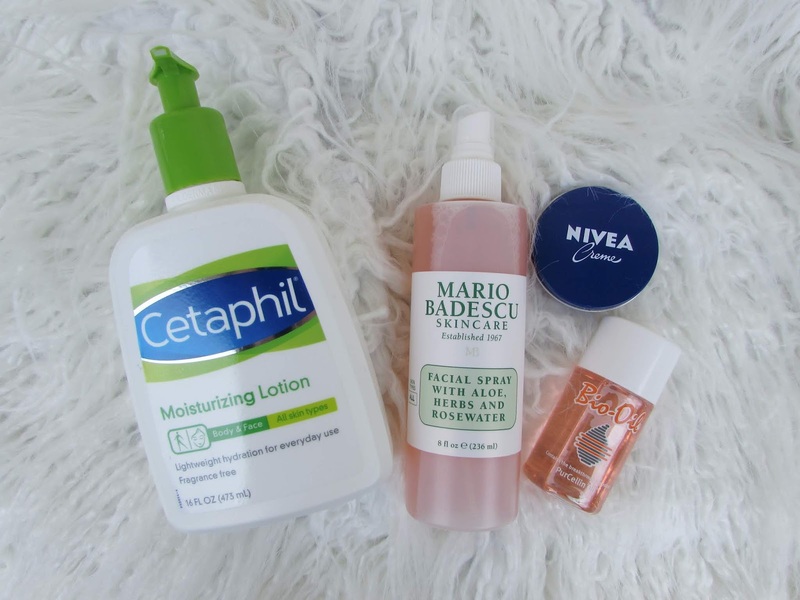 I do tend to have skin that's more on the sensitive side, and these products have all worked for me. 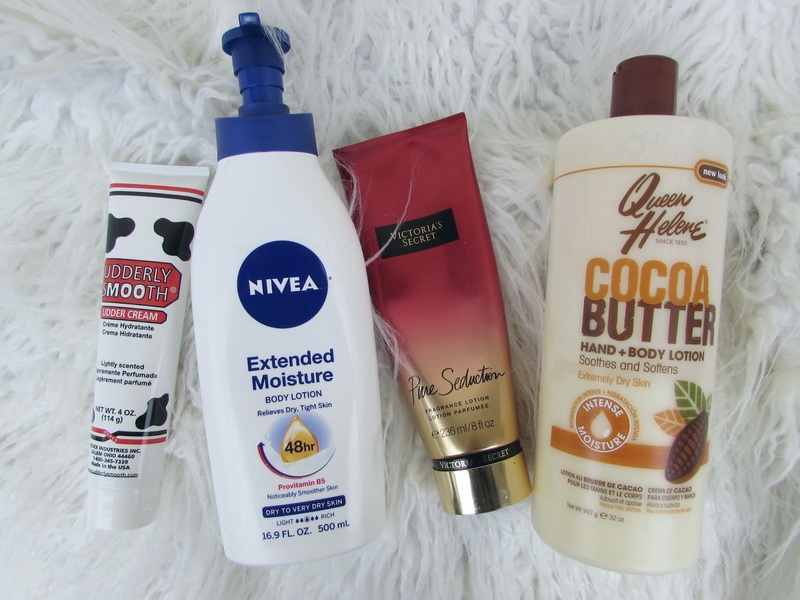 I use the same moisturizers in all different seasons for the most part. I have never encountered a lotion smell SO good and SO noticeable! If you want a lotion that does the job moisturizing skin, won't irritate sensitive skin like most fragrant lotions, and will actually maintain its scent, look no further. Victoria's Secret also almost always has this on sale, so it's usually more like $7. My hands get nightmarishly dry in the winter time and tend to break out into hives. When my hands start looking dry and cracked, I apply this stuff and it brings them right back to life. This is really an amazing product, it leaves your skin totally plump and hydrated in a matter of seconds. I will also use this on my elbows and knees too. Every time I step out of the shower I apply this everywhere. 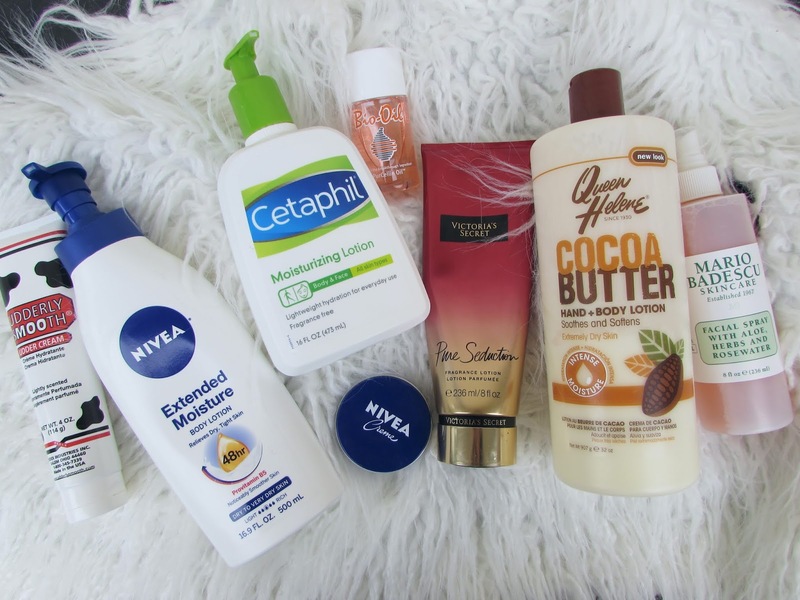 Nivea is a trustworthy, reputable lotion brand that I absolutely love. The consistency of this lotion is not too thick and not too thin, and it absorbs into the skin very nicely. I remember my first time using this stuff was at a friend's house I was staying over. The thing that amazed me was after a few days of using this, the eczema I have on the back of my arms seemed so much better! I couldn't believe how smooth the once-bumpy area was. This consistency is a bit thin, but it's worth trying for areas where you might have bumpy skin. How much more can I say about Bio-Oil? Besides being the best thing I ever used for getting rid of my acne scars, this is a great moisturizer to give me a heavenly glow. Be careful because if you're skin is very acne prone this could break you out. For me though, if I apply a light layer of this on my face, it gives me a non-heavy perfect amount of moisture and makes me look beautifully dewy. This was great when I was traveling and I feel like it evens out your whole face's skin tone. Click here to read my full Bio-Oil post! This is maybe the third post I'm featuring this spray in. The first time was when I had first purchased the famously Instagramable spray, and I was dubious about if it worked or was just a gimmick. Nowadays, this is one of my skin care staples! I spray my face with this the second I come out of the shower when my pores are open and it can absorb in. I feel like it definitely gives me a glow, and the ingredients make sure the little moisture boost is longer lasting than if you just sprayed water on you. This lotion is my rock, I use it every time after I wash my face. I can't stand face lotions that feel greasy, which is partly why I love this stuff so much. Cetaphil is light-weight and absorbs into the skin beautifully to leave me refreshed. I never feel like this breaks me out, and it is very gentle. This 16 oz size lasts a really long time too! I bought this tiny tin for only $1 at least 3 years ago and it still has a decent amount of product left. I only use a small dab on super dry areas of my face, which happens to me especially in winter time. This is very rich, and I would not recommend putting over your entire face because it might clog pores. On dry areas though, it brings them right back to life.